Our hot air balloon has plenty to do inside. All of our jumper / spacewalks are all day rentals. 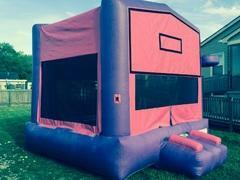 Our deluxe bounce house with hoop has two basketball goal for added fun. Large red and blue castle top spacewalk with basketball goal in the inside. 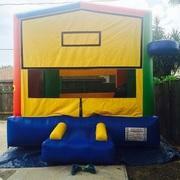 Our tropical theme bouce house is very large and spacious for never ending jumping and everlasting fun. This bounce house has 2 basketball hoops for added fun. 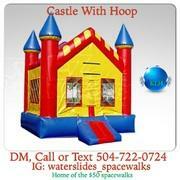 Deluxe Red and Blue Castle Top Spacewalk with basketball goal and pop up in the inside.